Bring all new flavors to your specialty drink menu with this Torani sugar free s'mores flavoring syrup! It's sweetened with Splenda brand sweetener, which offers the taste of real sugar without the calories. This tempting flavor will complement your beverages without overpowering them or being too sweet, while the user-friendly bottle will be convenient for your busy baristas to use. Torani flavoring syrups are specially formulated to resist curdling in milk and to hold up well under heat, making them the perfect choice for espresso-based drinks, brewed coffee or tea, and more. Use this flavor for frappes, iced coffees, smoothies, and even baking! The Torani Sugar Free Smores Flavoring Syrup is one of my favorites! It goes well in just about any type of dessert. I use it in ice cream, and the flavor this syrup gives is great! Can you say s'mores in a bottle? This is a delicious sugar-free alternative to the sweet dessert. I add this to my lattes, along with a couple squirts of Torani's sugar-free white chocolate sauce and instantly feel like I'm roasting marshmallows over a fall campfire. We could not have been more pleased with the SF S'mores flavoring syrup, as we placed a few tablespoons into our homemade ice cream maker and it was a hit for my daughters birthday party. After adding the whipping cream and evaporated milk, this just melted in my mouth with no aftertaste. Superb! I am flummoxed on this sugar free flavor. I do not taste chocolate, Graham or marshmallow in this. It is just an odd flavor. This is one of the slowest moving flavors as it has an odder taste. I have yet to find a way to make it work. Very nice tasting. Tastes great to sweeten up some hot or iced coffee without the guilt of the higher sugar syrups. Also tastes great in a protein shake! Sugar free smores has been a favorite. It pairs well with many different flavors and is rich and tastes great! I like pairing it with chocolate syrup, espresso and milk! I like to order the sugar free syrups to add to my coffee or hot chocolate. I find the Torani syrups in general to be pretty good and this Smores flavor is the BEST in hot chocolate. Add to cocoa and top with whip cream and graham cracker crumbs... yum. A great syrup on its own or paired with the chocolate flavor! I love the selection of sugar free syrup flavors. The most variety that I've found anywhere so far. Its a very sweet and has a good flavor, Sugar-free products are not my favorite and I wish they had the regular ones but this will have to do. Kids loved it, but it wasn't my favorite and I prefer to stick to the more natural flavors when possible- just wish they offered the sugar free natural torani syrups! Torani is my favorite brand of flavoring syrups. I love when they make creative sugar free options. This is one of their better ones. It really tastes like smores. I use a little in protein shakes when I want to indulge in a special treat. This Torani flavor works well with milkshakes and blended coffee drinks. This Sugar Free S'mores Syrup blends easily and is one of our most popular flavors. I have been adding this flavoring syrup to my winter ho chocolates with delicious results. The kids absolutely love it and the adults can really taste a difference! S’mores are my absolute favorite treat and this syrup not only smells exactly like s’mores it taste exactly like it !! This is a must have !! Torani does it again with this great "S'mores" flavor. It is sugar free however it doesn't have a weird aftertaste like most sugar free syrups. Just buy it you will love it you're around! How can you make a smore smoothie without syrup I don't know and I certainly don't want to find out with this product added my shakes taste amazing and my customers rave about it! I enjoy the sugar free s'mores in both my hot or iced coffee it is a sweet addition but is not a very distinguished flavor. Torani Sugar free S'mores is one of my personal favorites!. It has an authentic flavor and tastes just as good as the ones with sugar. We love this syrup, especially in the fall. It's great when we make a s'mores latte or when we need to just sweeten something up. My husband and grandchildren won't stay out of my syrups! This is one of their favorites. and they all love to mix it into a big cold glass of chocolate milk. It is ok...I have a bottle stashed in case they use it all and forget to tell me. Love Torani syrups. I am so glad I bought this S'mores syrup. My smores shake was not up to par until I found this syrup and now it is near perfect! Love this syrup! It's one of our most popular ones. Such a great true taste that sweetens any type of drink. Whether hot or cold! Maybe it's their choice of alternative sweeteners but these Torani sugar free ones aren't my favorite flavoring syrups. They do the job and the brand is well known. Strong S'mores flavor that tastes wonderful in an iced coffee! It's strong enough that the flavor easily comes through without overwhelming the taste of the coffee. It's a sweet treat! Can you imagine anything better than a big piece of chocolate, and a fire roasted marshmallow, stuffed between two Graham crackers? Such a sweet treat for sure! Torani Sugar Free S'mores Syrup pulls the other ingredients together for my on-the-go S'mores smoothie. Who said people with a super busy life have to go without! My dad is diabetic, and it is sometimes hard to find a great tasting products that he can have.he loves icecream but the sugar free flavors are limited. We were thrilled when we saw the variety on here. This is a great tasting product, and a great price for the amount of drinks you can make with it. One of your best syrups in sugar free. Will continue to order this item in the future. I use this product in coffee each morning. This is the best flavor out of all of the Torani Poducts. You can really taste the S'more flavor, picture a summer night sitting around a camp fire making a S more. Now you get that flavor in your coffee. I have started to even put the syrup on my pancakes, Nothing like S mores pancakes for breakfast. It is hard to imagine coffee that tastes like smores but this syrup tastes just like it! I couldn't believe how good it was when I first tried it. Now I am a loyal customer. This stuff is so good! I've been on a Torani sugar-free syrup tear! They're great for jazzing up my boring protein/diet shakes! I've tried a lot of them in these past couple of months, and am happy to share my reviews. Hopefully, you'll find them useful. I certainly wished that there had been more descriptive reviews on the syrups I'd ordered. 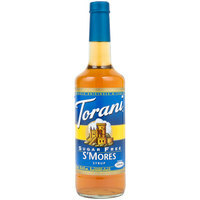 S'mores - This is, hands down, one of the BEST flavored syrup in the Torani syrup family. This syrup actually lives up to it's name, and certainly does taste exactly like s'mores! It's got hints of chocolate, graham cracker, and even a little marshmallow. It even smells good, which is not something I can say for all they syrups---a lot of them just smell like alcohol (or whatever liquid is used to suspend the flavorings). You definitely get what you see w/ this syrup. I've mixed it into my chocolate and my vanilla protein powder shakes. Really good and very satisfying. The Torani sugar free S'mores flavoring syrup is one of our favorites. It makes a great cup of coffee and a great cup of ice coffee. We mix it with other Torani flavorings to create unique blends. This is another personal favorite of mine. I use it in my hot chocolate and my coffee. It reminds me of my childhood and just seems to hit the spot. This is my absolute favorite sugar free syrup flavor. There is a wonderful graham cracker flavor that is prominent, and a nice subtle marshmallow and chocolate flavor as well. We use nothing but Torani branded syrup in our store.. the quality is second to none and a very reasonable price. Only Webstaruant store has the most selections that you will be able to find. So far, my absolute favorite flavor! Flavor notes are heavy on the chocolate, followed by graham cracker, with a hint of marshmallow. Just a little of this syrup goes a long way in milk, ice cream, or coffee. When I added this to my iced coffee, at first I couldn't taste much flavor at all. Then I added a little bit of creamer and tasted again and it definitely tasted like a s'more. I especially tasted the marshmallow. Very good! Toriani syrups are classics and thIs sugar free S'mores flavor tastes just like the real thing! We like that these are flavored with Splenda rather than aspartame. Highly recommend! I was a little skeptical about a s'mores flavored coffee syrup -- especially a sugar-free one -- but Torani proved yet again the quality of their syrups! The shipping was also quick and the glass bottles were secure. I plan to order again. I LOVE Torani's s'mores sugar free syrup. I use it to make s'mores flavored coffee, oatmeal, etc. My favorite way to use it is mixing 3T SF s'mores syrup into my hot chocolate—SO delicious. I HIGHLY recommend this product! If you like the flavor of S'mores you will like this syrup. I bought this because I was curious about how it would taste. The S'mores flavor is very pronounced, I could really taste the burnt marsh mellow and graham cracker flavors in it.. I liked it more when I mixed it in with my coffee and added some almond milk to mellow it out. Overall, good product. Shipping was very quick. Love this Torani sugar free s'mores flavoring syrup we make a s'mores smoothie and this product makes the smoothie just perfect. We love this syrup. Try one today you will not be sorry. This S'mores flavor is one of the best that I have tasted! You can defiantly taste the graham cracker flavor. It gives anything that you add it too a S'mores taste. Highly recommend! I could not wait to create a sugar free treat from this syrup. As with all products, the syrup was shipped in a very timely manner at a lower-than-expected price. The syrup, as with many of the Torani syrups, did not disappoint! This sugar free treat is excellent for those watching calories or unable to consume sugar. As always, this transaction was another winner for me! This is a great addition to my morning cup of coffee. It really lets me add variety to my coffee with out all the added calories. Great product! One of my favorite flavors! Torani Sugar Free S'mores Flavoring Syrup is like a campfire in a bottle! I wondered how well the graham-cracker element would come across in syrup form, and I was pleasantly surprised. I find the graham-cracker and marshmallow flavors to be more noticeable in solid foods, rather than coffee drinks. I flavored a small batch of homemade whipped cream with 2 tablespoons of this syrup and topped off my coffee with it. Yum!